When the WPT goes to Italy next month, an Intertops Poker online satellite champion will be at the table for the WPT National Main Event in Venice next month. Three-tier online satellite tournaments have just begun. begin today at the most popular poker site on the Revolution Poker Network. You can buy in at any stage, but wouldn't it be great to win your way from the $2+$0.20 Step 1 level all the way to the online Final and then the live tournament in Venice?! Intertops Poker’s $2,200 WPT Prize Package includes €990 buy-in for the WPT National Main Event plus premium hotel accommodation near the casino and cash for travel expenses. The €200,000 guaranteed WPT Venice event will be at the Casino de Venezia, the oldest gaming establishment in the world. It starts April 17th and the Final Table is on the 20th. 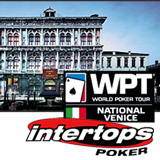 Anyone (over 18) can register for Intertops WPT Venice Satellite Tournaments under the Tournaments tab at Intertops Poker. Oh... and until Monday, March 16th Intertops Poker will double your deposits, up to $100. Claim this bonus by entering bonus code WPT1 when your deposit.